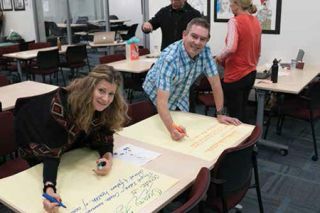 Teryl Campbell and Brian Kull receive peer reviews about their project in a “gallery walk.” At Laguna Beach (CA) Unified School District, professional learning has evolved beyond the traditional “sit and get.” With their new “Rocket Ready” (www.RocketReady.org) program, they’re launching a fresh approach to PD. ■ Celebrating the art and the science of teaching. In addition, Rocket Ready incorporates opportunities to create world change. Mentors from CUE—Alice Chen, Sean Ziebarth, Bill Selak and Jerermiah Ruesch, inspire teachers. The Rocket Ready program was developed to address the weaknesses in traditional staff development programs. The program launched in September 2016 with 40 pilot teachers who volunteered to assist in refining a training model that other districts could replicate. Key technology leaders form an advisory board that has guided the pilot components and processes. The program is based around a simple but revolutionary idea: Laguna Beach USD pays its teachers to solve real-world problems with their students. Teachers also meet, collaborate, and learn with other teachers as they work towards realizing their goals. The Rocket Ready program incorporates five micro-credentials that involve technology and line up with Universal Design for Learning (UDL) principles as well as the Buck Institute’s Project Based Learning. These credentials take teachers approximately 15 hours to complete and focus on evidence that teachers produce with their classes. Teachers are paid only when they demonstrate the evidence that is required to complete that micro-credential. This is not a hoop to jump through; it is a step that will contribute to their overall project. ■ Tech Essentials Specialist. This covers the basic tools, including collaboration and creation tools, that are critical for working with students to solve a problem. ■ Engagement Specialist. Modeled after one of the essential components of UDL, this credential focuses on recruiting student interest as well as on persistence and self-regulation. ■ Representation Specialist. Another UDL component, this credential explores the variety of ways students can take in content through visual and auditory means. ■ Action and Expression Specialist. For this credential, teachers look at all the different ways students can demonstrate knowledge about what they’ve learned. They might use technology to show learning, for example, but they might do so using a non-traditional platform such as music or video. ■ For the final micro-credential, called the WorldChanger, teachers and students produce a video that demonstrates how they attempted to change the world. In one project, students observed that their local oceans have seen a surge in plastics that steadily grind down to microbeads that move into their food supply. Art students at LBHS are creating an art exhibit that will bring awareness to this issue. Elementary students have been using Twitter to make people aware of this project, as well as volunteering their time to do beach cleanups and make artwork to promote awareness. They have taken the plastics and redesigned them into toys and other products. In another project, third and fifth graders in Patti Rabun’s and Azadeh Baghai’s classes made backpacks with goodies from the Dollar Store for homeless people. Each micro-credential brings teachers one step closer to the goal of World Changer. Michael Morrison is chief technology officer for the Laguna Beach (CA) Unified School District. This video (tinyurl.com/LagunaRocketReady) has more information about the Rocket Ready Program at Students at Laguna Beach U.S.D.One of the first things to analyze when attempting to solve a real-world problem is what resources are available. Laguna Beach USD doesn’t just demonstrate how to use Google Forms, therefore, but uses it to compile all of the students’ passions and abilities that can be fuel to solve problems. Academic coaches are the key to assisting teachers with improving teaching and progressing towards their goals in Rocket Ready. There are two observations for each teacher. One observation is done using an Orah VR camera so both the coach and the teacher can look around the room at the students as the lesson is being taught. The other is an in-person observation. Laguna Beach USD has also sought out “teacher gurus” outside the district who are experts in integrating technology and learning. These gurus check in with teachers through Google Hangouts to listen, lead, and advise. Teachers can earn money to use in their classrooms to support their projects by accumulating points towards their micro-credentials. They can accumulate and use these funds for varying levels of resources that will help them complete their projects.The culmination of each Rocket Ready project is a celebration. As teachers show the videos they produce and earn the top of a rocket capsule, it is a time to honor and respect the art and science of teaching. The Rocket Ready program enables students and teachers to launch their ideas and engage in the messy, exhilarating, and memorable work of changing the world. Michael Morrison is the Chief Technology Officer for Laguna Beach Unified School District (http://www.LBUSD.org). Laguna Beach USD has been recognized by the State Superintendent as one of three districts to watch in CA as a “leading digital district.” His innovative approaches to inspiring learning spaces and staff development have placed him in leadership positions around the state. He has served on the CUE board and been a guest speaker nationwide. He is the leader of the Rocket Ready movement (http://www.RocketReady.org) which focuses on outcomes-based staff development (gamification, micro-credentials).